An aerial view of some of the world’s highest mountains as viewed from the south. In the center is Mount Everest, the highest peak on Earth. It rises over Lhotse (#4), while Nuptse is the ridge on the left. The Himalayas, of which these mountains form a part, are home to most of the world’s highest peaks. There are at least 100 mountains with heights of at over 7,200 metres (23,622 ft) above sea level, all of which are located in central and southern Asia. Only those summits are included that, by an objective measure, may be considered individual mountains as opposed to subsidiary peaks. One of figures of topographic prominence: The prominence of a peak is the height of the peak’s summit above the lowest contour line encircling it and no higher summit. For example, vertical arrows show the topographic prominence of three peaks on an island. A dotted horizontal line links each peak (except the highest) to its key col. The dividing line between a mountain with multiple peaks and separate mountains is not always clear (see also Highest unclimbed mountain). A popular and intuitive way to distinguish mountains from subsidiary peaks is by their height above the highest saddle connecting it to a higher summit, a measure called topographic prominence or re-ascent (the higher summit is called the “parent peak”). A common definition of a mountain is a summit with 300 m (980 ft) prominence. Alternatively, a relative prominence (prominence/height) is used (usually 7–8%) to reflect that in higher mountain ranges everything is on a larger scale. The table below lists the highest 100 summits with at least 500 m (1,640 ft) prominence, approximating a 7% relative prominence. A drawback of a prominence-based list is that it may exclude well-known or spectacular mountains that are connected via a high ridge to a taller summit, like the Eiger or Nuptse. A few such peaks and mountains with nearly sufficient prominence are included but not numbered in this list. It is very unlikely that all given heights are correct to the nearest metre; indeed, the sea level is often problematic to define when a mountain is remote from the sea. Different sources often differ by many metres, and the heights given below may well differ from those elsewhere in this encyclopedia. As an extreme example, Ulugh Muztagh on the north Tibetan Plateau is often listed as 7,723 m (25,338 ft) to 7,754 m (25,440 ft), but appears to be only 6,973 m (22,877 ft) to 6,987 m (22,923 ft). Some mountains differ by > 100 m (330 ft) on different maps, while even very thorough current measurements of Mount Everest range from 8,840 m (29,003 ft) to 8,850 m (29,035 ft). These discrepancies serve to emphasize the uncertainties in the listed heights. Though some parts of the world, especially the most mountainous parts, have never been thoroughly mapped, it is unlikely that any mountains this high have been overlooked, because synthetic aperture radar can and has been used to measure altitudes of most otherwise inaccessible places. Still, heights and/or prominences may be revised, so that the order of the list may change and even “new” mountains could enter the list over time. 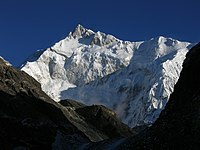 To be safe, the list has been extended to include all >7,200 m (23,622 ft) peaks. The highest mountains above sea level are generally not the highest above the surrounding terrain. There is no precise definition of surrounding base, but Mount McKinley, Mount Kilimanjaro and Nanga Parbat are possible candidates for the tallest mountain on land by this measure. The bases of mountain islands are below sea level, and given this consideration Mauna Kea (4,207 m (13,802 ft) above sea level) is the world‘s tallest mountain and volcano, rising about 10,203 m (33,474 ft) from the Pacific Ocean floor. Ojos del Salado has the greatest rise on Earth— 13,420 m (44,029 ft) from the summit to the bottom of the Atacama Trench about 560 km (350 mi) away, though most of this rise is not part of the mountain. The highest mountains are also not generally the most voluminous. Mauna Loa (4,169 m or 13,678 ft) is the largest mountain on Earth in terms of base area (about 2,000 sq mi or 5,200 km2) and volume (about 10,000 cu mi or 42,000 km3), although, due to the intergrade of lava from Kilauea, Hualalai and Mauna Kea, the volume can only be estimated based on surface area and height of the edifice). Mt. Kilimanjaro is the largest non-shield volcano in terms of both base area (245 sq mi or 635 km2) and volume (1,150 cu mi or 4,793 km3). Mount Logan is the largest non-volcanic mountain in base area (120 sq mi or 311 km2). The highest mountains above sea level are also not those with peaks farthest from the centre of the Earth, because the figure of the Earth is not spherical. Sea level closer to the equator is several miles farther from the centre of the Earth. The summit of Chimborazo, Ecuador‘s tallest mountain, is usually considered to be the farthest point from the Earth’s centre, although the southern summit of Peru‘s tallest mountain, Huascarán, is another contender. Both have elevations above sea level more than 2km less than that of Everest. Most mountains in the list are located in the Himalaya and Karakoram ranges to the south and west of the Tibetan plateau. 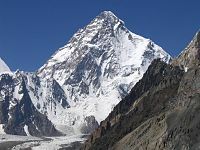 In fact, all 7,000 m (23,000 ft) peaks in the world are located in the centre of Asia (East Asia, Central Asia and South Asia) in a rectangle edged by Noshaq (7,492 m or 24,580 ft) on the Afghanistan–Pakistan border in the West, Jengish Chokusu, (Tuōmù’ěr Fēng) (7,439 m or 24,406 ft) on the Kyrgyzstan – Xinjiang border to the North, Gongga Shan (Minya Konka) (7,556 m or 24,790 ft) in Sichuan to the East, and Kabru (7,412 m or 24,318 ft) on the Sikkim(India) – Nepal border to the South. The locations of the highest mountains are shown on the composite satellite image of High Asia below. The numbers refer to the ranking in the list. For clarity, lower peaks with labels overlapping higher peaks are left out of the main image. The boxed regions are those with the highest density of summits and are enlarged in two separate images to show all peaks. The following is a stem and leaf plot of the above data. The two digits to the left of the line are the first two digits of the mountain’s height (meters), and each digit to the right of the line represents the third digit of the mountain’s height. Each number on the right is linked to the corresponding mountain’s article. For example, the height of one of the mountains (namely Mount Everest) is 884x meters. Also, it is apparent that there are only 5 mountains above 8,200 meters. ^ Krulwich, Robert (April 7, 2007). “The ‘Highest’ Spot on Earth?”. Retrieved 21 March 2009. ^ For Nepal, the heights indicated on the Nepal Topographic Maps are followed. For China and the Baltoro Karakoram, the heights are those of “The Maps of Snow Mountains in China”. For the Hispar Karakoram the heights on a Russian 1:100,000 topo map  seem to be more accurate than the customarily quoted heights probably based on US army maps from the 50s . Elsewhere, unless otherwise indicated, heights are those in Jill Neate’s “High Asia”. ^ Coordinates were established by comparing topographical maps with satellite images and SRTM-derived terrain maps. The terrain maps and satellite images often don’t match exactly. An asterisk (*) indicates that the map and image are shifted by more than 100 m (4″) and/or that the landscapes around the summit don’t match. ^ The prominence data were extracted from a combination of maps and computer aided analysis of NASA‘s 3″ SRTM data. Prominences over 1,450 m were copied from this website. ^ Here defined as the first higher mountain beyond the key saddle with at least 500 m prominence itself. ^ The number of ascents and failed attempts up to 2004 is extracted from the Club Himalayan index. These are the number of expeditions (not individuals) that announced their ascent or attempt in a journal. They are probably quite accurate for the rarely climbed peaks (though omissions were noted), but greatly underestimate the number of ascending parties on the easier and/or more popular mountains, like most eight-thousanders. For instance, Mt Everest has been scaled 2,251 times by individuals up to 2004 . ^ Given the large differences between multiple “final” measurements of Mt Everest, the traditional 8,848 m is listed. 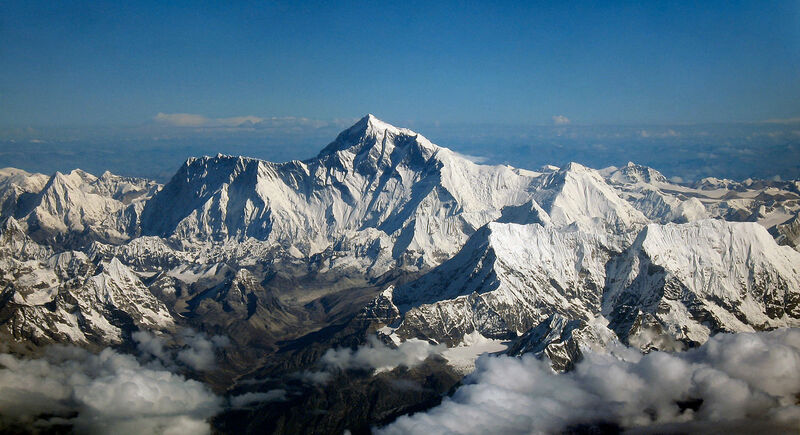 For more information, see Mount Everest#Measurement. ^ Everest IS parent to K2 by the definition of topographic prominence. See also, the discussion page. ^ The highest (Eastern) summit of Saser Kangri II has just recently been climbed, August 24th, 2011 . The lower West peak, 2.5 km away, has been climbed in 1984 and twice since. ^ The height is unknown, but over 7,200 meters on both Chinese and Russian maps of the area. ^ The name and information about this summit was extracted from the May 2003 edition of Japanese Alpine News.